We are a full-service real estate company specializing in residential and multi-family real estate. 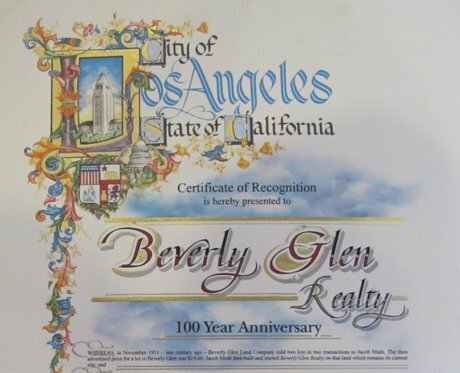 Established in 1911, we provide a full complement of brokerage, leasing, property management and design for residential and commercial properties in Bel Air, Beverly Hills, Brentwood, Benedict Canyon, Hollywood Hills, Beverly Glen Canyon and West Los Angeles. We are the oldest, independent real estate office in Los Angeles. Our building on Beverly Glen Boulevard in Bel Air has been a Westside Landmark for over 100 years! Steven Foonberg is the Owner and Managing Broker. Steven and the other agents are homeowners on the Westside, and are also active real estate investors. We understand the needs of a first time home buyer, a professional who has relocated to Los Angeles, a multi-generational family investment trust, and everyone in between. We are not sales people, we are Real Estate Professionals. We are located at 1615 North Beverly Glen Boulevard in Bel Air, about 1/2 way between Sunset Boulevard and Mulholland Drive. We are proud to be recognized by the City of Los Angeles for our 100 Year Anniversary!